Although there are so many alternatives, Windows Explorer remains my favorite Hard Drive browser. Windows Explorer’s look and feel has remained the same for quite sometime but that changed when the ribbon interface was added to Explorer. A few days back I encountered a problem when Windows Explorer was showing wrong or incorrect disk space usage in the drive properties. This article explains how I fixed this problem. This problem was weird and I had never encountered such a problem before. Actually I wanted to shrink the size of my system drive (C drive) because I had moved all my documents including C:Users to D drive so that if something happens to the Operating System, my data remains safe all the time. When I opened C drive properties by right clicking the C drive and going to Properties, I saw that the space used was more than what I was expecting. So I decided to dig deeper and enabled the view of all system files and hidden files in C drive, selected all files and opened their properties. This was showing different size from the drive properties. 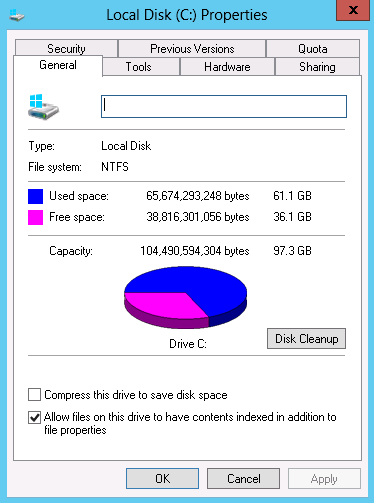 I ran Disk Cleanup but it was of no use as it didn’t suggest much space could be recovered. Something else was wrong. I decided to use a third party tool to see where my space was going visually. For this, I selected WinDirStat which is a wonderful tool for visualizing the spaced occupied by files and folders in any drive or folder. 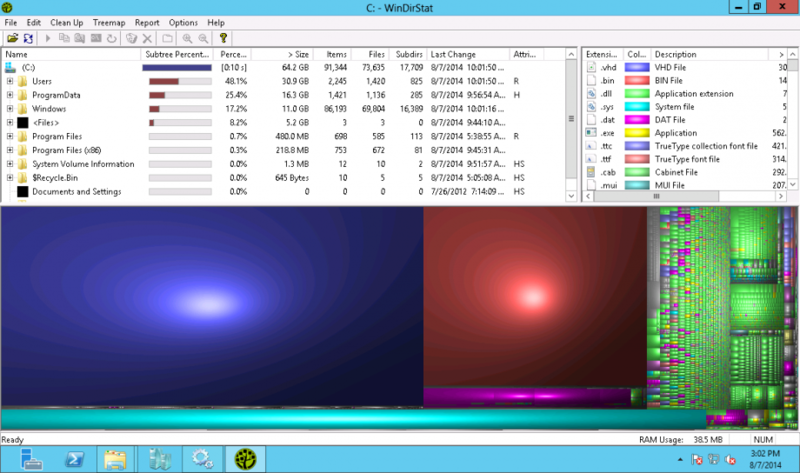 The best thing about WinDirStat is that it also comes as a portable tool so I can run it without installing. The first run of WinDirStat was not useful and it showed the same amount of space used as by selecting all files in C drive. Then I found some folders which were showing zero byte size. This was unusual as System Volume Information and C:UsersPublic were also zero bytes. The common thing in these folders was that I was unable to open these folders. I closed WinDirStat and ran it with administrative privileges. 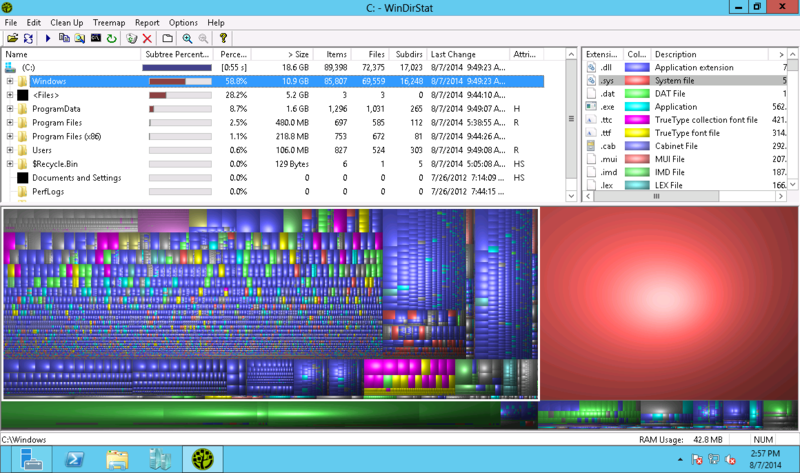 WinDirStat started showing the correct stats after running with administrative mode. The culprit was an VHD file which was taking about 30 GB of space and Windows Explorer was showing it as zero bytes due to incorrect permission settings. I had to set the folder permissions to become the owner myself and then deleted the file to save extra space. I hope this will be helpful for those who think the Windows Explorer is not showing the correct disk space usage. It is usually due to permissions on folders on which we don’t have access and WinDirStat was helpful in sorting out the problem. By the way, I am using MiniTools Partition Wizard free edition to resize my drives. I have been using it for quite a long time and only once it has corrupted my drive structure and data. So you should always backup your data before doing anything sensitive. Nice work and I think I know what to do now. And in order to thank you for your nice work, you many want to know some 100% free data recovery software, like Recuva, iCare Data Recovery Free, PC Inspector Recovery and PhotoRec. Hope it will also help you somehow. The largest file WinDirStat found was a integratedofffice.exe file (93gb). Am I okay to delete this or at least compress it or something? Please help! windows says that I have only 33Gb free but if I boot from linux usb it says I have 72GB free. how do I get the correct free space to show in windows because it will not let me use it. Running WinDirStat as Administrator was the secret for me. Once I did this, it found a 330GB transaction log from from my Sql Server database that had grown way too large. Once I say that, I was able to google and figure out how to reduce the transaction log file size. World No 1 Website !!!!!!! And make the site even better? Thanks for the compliments! Any suggestions for making it better? how can I see the hard drive size from command prompt? Just disable VSS shadow copy service and then enable it, this should do the trick. What does disk management show? disk mgmt should show the actual size of the hard drive. Shadow copies, virtual paging files, hibernation file all add to this hard drive clutter. If you disable all these things, this should show the correct disk space on your drive. I think defragmenting your hdd will fix this problem? I have my 500 GB hard drive which shows only 465 GB after formatting. Will this be fixed by your method? I want to use complete 500 GB. No, you will never be able to use the full size of a HDD or SSD because windows has to use some space for system files and the sort to make the drive work properly.